The heavyweight among water stocks has been gushing strong returns. Can its outperformance continue? Shares of American Water Works (NYSE:AWK) returned 16%, including dividends, in the first quarter of 2016 -- equivalent to a sizzling annualized return of nearly 64%. This performance by the largest investor-owned water and wastewater utility in the United States mops up that of the S&P 500, which returned 1.4%. It also leaves underwater the performances of the second- and third-largest publicly traded companies in the industry, Aqua America (NYSE:WTR) and American States Water (NYSE:AWR), which returned 7.4% and negative 5.7%, respectively. 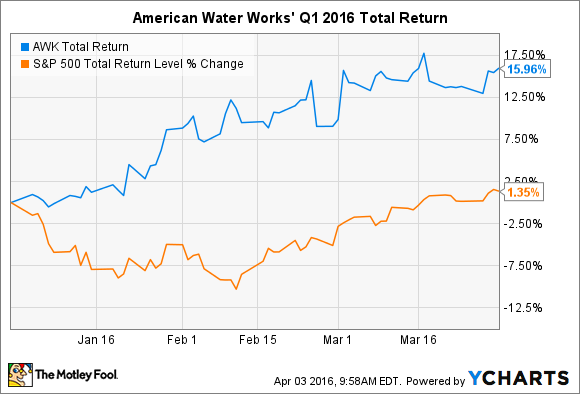 American Water Works also leads the pack over the longer term. For the five-year period, the company's 182% return bests American States Water's 157%, Aqua America's 99%, and the broader market's 73% returns. 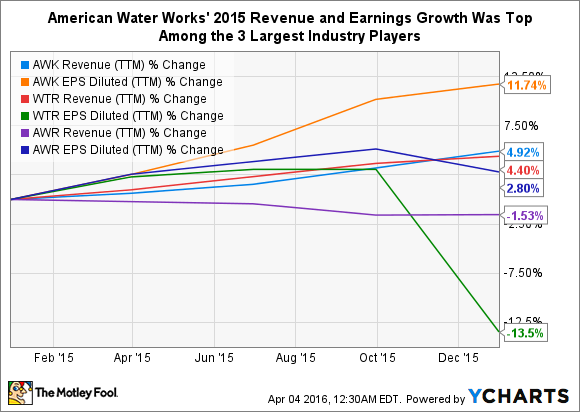 Why has American Water Works stock been red-hot in 2016? And can its outperformance continue? American Water Works provides water and wastewater services to an estimated 15 million people in 47 U.S. states and one Canadian province. It operates as a regulated utility in 16 states. The company also has a market-based business that primarily builds, operates, and maintains water and wastewater facilities for military bases, municipalities, industrial customers, and others. The regulated business provides a predictable cash flow -- which the company uses to buy smaller players in the fragmented industry and to fund its reliable dividend -- while the market-based business provides an opportunity for organic growth. American Water Works stock's outperformance in the first quarter was largely due to investors' flight to safety amid a challenging market. While the broader market managed to eke out a slight gain in the quarter, the S&P 500 had been down as much as 10.5% year to date in mid-February. 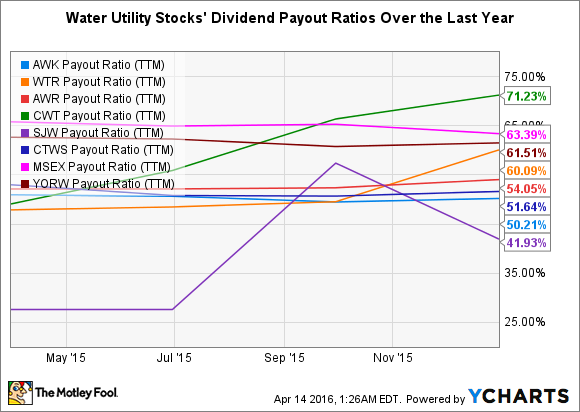 This caused many investors to seek safer investing harbors -- utility stocks in general were a major beneficiary. This flight to less-volatile water utility stocks caused the valuations of almost all of these stocks to rise. 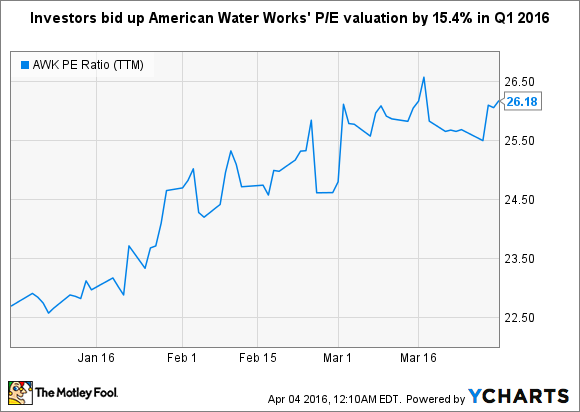 American Water Works' price-to-earnings ratio increased 15.4% in the quarter. While the Q1 stock price jump was due to a rising valuation, there are good reasons that some investors poured money into American Water Works' stock rather than the stocks of some of its peers. It has two primary advantages: industry-leading size and geographic diversity. American Water Works has a market cap of $12.4 billion. This is more than twice the $5.5 billion market cap of Aqua America, and about nine times the $1.5 billion market cap of American States Water. This large size relative to others in the industry provides the company with the financial resources to grow its regulated business by acquiring smaller players in an extremely fragmented industry. It also allows the company to grow its market-based business, as municipalities that own their water systems are increasingly contracting out their operations. The company has a boatload of cash relative to its peers and a manageable debt load, especially in such a low-interest-rate environment. American Water Works is by far the most geographically diverse water utility. As mentioned above, it operates in 47 U.S. states and one Canadian province, and operates as a regulated utility in 16 of these states. Its two largest peers, Aqua America and American States Water, operate in eight and seven states, respectively, though the lion's share of American States' business is in one state, California, where it operates its only regulated business. One benefit of this geographic diversity is that it allows for greater operational efficiency. The company can often expand its operations without adding new management teams. Additionally, this diversity makes it less vulnerable to drier-than-usual weather or droughts, which can pose challenges to water utilities. These two primary advantages should help the company continue to post superior revenue and earnings growth relative to its peers just as it did in 2015. The company's current payout ratio (dividends paid as percentage of net income) of 50.2% is the second-lowest among the eight water utilities that operate in the U.S. and have market caps of at least $300 million. Dividend ratios less than roughly 70% generally suggest that a company should be able to comfortably afford to pay its quarterly dividends. Stocks shown are American Water Works (AWK), Aqua America (WTR), American States Water (AWR), California Water Service (CWT), SJW Corp. (SJW), Connecticut Water (CWTS), Middlesex Water (MSEX), and York Water (YORW). Data by YCharts. American Water Works' conservative dividend policy is a plus for investors who are more concerned with long-term capital appreciation than current income. There are plenty of opportunities for the company to use its funds to expand its business. Investors whose top concern is current income, however, might want to look elsewhere. The company's current dividend yield of 1.9% is the lowest among our eight industry players. Water utility stocks are attractive investments because fresh water is an essential commodity. Moreover, supplies could decrease because of the Earth's long-term warming trend. American Water Works is a top choice in the industry, largely because of its huge relative size and geographic diversity. The stock is best-suited for conservative investors whose primary concern is capital appreciation, as well as for the conservative portion of many investors' portfolios.